Haddon Rig is a mixed-farming aggregation located in central west NSW. Founded in 1882 as a merino stud, Haddon Rig is privately owned by the Falkiner family: George, his wife Sally, and their four daughters, Eleanor, Grace, Olivia and Florence. In 2016, the Falkiner family celebrated 100 years of ownership. As one of Australia’s premier Merino studs, core values of family, quality and integrity are at the heart of everything we do. Haddon Rig has a well-earned reputation as one of the foremost Merino studs in Australia. A reputation earned through consistent performance of our genetics in the paddock and in the show ring. Haddon Rig’s mission is to breed productive, fertile and high-yielding merino sheep of exceptional quality that will perform consistently for our clients. We achieve this through selective breeding from Haddon Rig genetics, utilising industry best practice in nutrition and husbandry and combining ASBV data with professional classing. Haddon Rig produces 5000 stud ewes and 2000 commercial ewes each year. A further 900 horned rams and 150 poll rams are bred each year, with the best of these offered for sale at the on-property auction and sale each September. In 2018, the Haddon Rig team launched Haddon Rig Merino lamb - a beautiful dry, aged lamb product that we supply direct to market. Haddon Rig Merino is delivered to Sydney and Brisbane monthly and is now served in restaurants including Porteno and Firedoor. For enquiries, please contact Charlie Blomfield at charlie@haddon-rig.com.au. Haddon Rig operates a cutting-edge dryland and irrigated cropping enterprise, including Gregory and Lancer wheat, chickpeas, Faba beans, and Lucerne. When season permits, Haddon Rig's irrigated cotton program expands to 400-1000 ha. With a focus on sustainable no-till farming, soil moisture and nutrient retention using innovative technology and industry-best management. Haddon Rig invests in on-farm innovation and efficiencies. 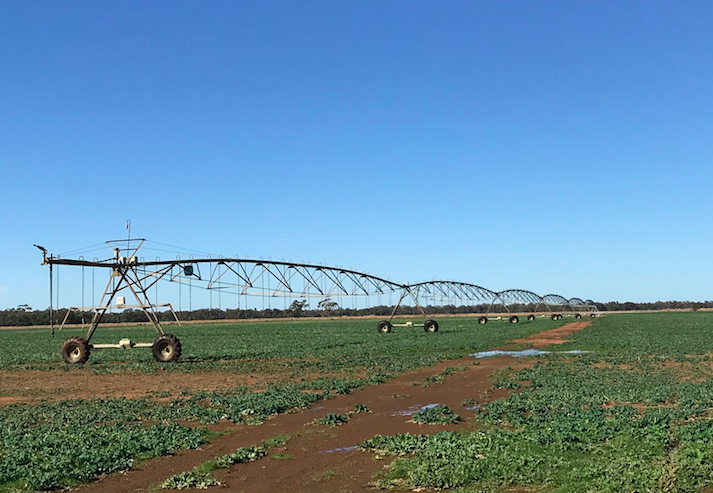 Haddon Rig's recent on-farm improvements include the installation of two centre pivots for irrigation, and a 2400 head automated sheep feeding system increasing drought resilience, water efficiency and the ability to turn off quality lambs, regardless of season. Haddon Rig can offer excellent employment opportunities and working conditions, with a great team environment. With industry-best management practice as well as a diverse enterprise mix, a job at Haddon Rig is a great way to gain experience or advance a career in agriculture. Please head to the MEET THE TEAM page to view job opportunities. 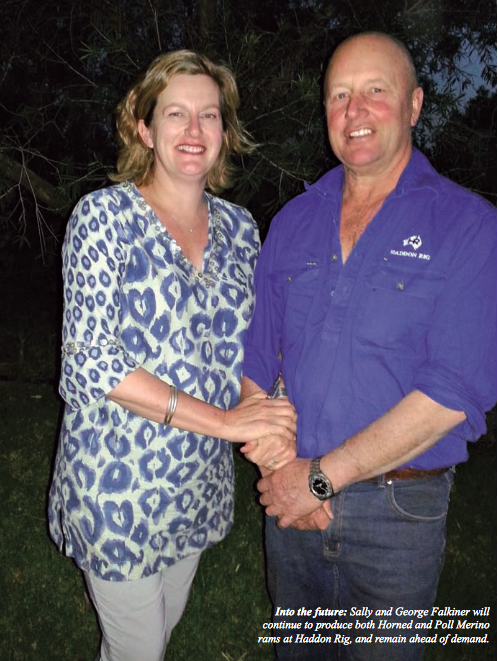 When Franc Falkiner purchased Haddon Rig in 1916, the genetic beginnings of a Merino stud had already been established by its first freehold owner, James Richmond. The stock had come from Wanganella, Falkiner's family stud in the Riverina, and also from Rambouillet in France. It is from this original flock that the Haddon Rig stud evolved - managed and classed selectively and carefully - so that "like begets like", and the distinctive consistency and quality of the genetics have carried on right through to the present day. The stud breeds 1200 large-framed, heavy cutting, soft bright woolled rams with hardy constitutions each year - ideal for wool and meat production and the differing demands of sheep grazing operations throughout Australia. Body size, frame and hardiness are vital to the sheep breeder. This is not only to ensure that the Merino ewe will produce maximum wool cut and lambs but also that the crossbred sheep will mature early and yield well, and will survive in very hostile environments. In 2000, the emphasis changed again to meet the demands of the meat market. Size, fertility and early maturing sheep carcasses became a priority, so the breeding programme followed suit. • First bloodline marketing association (in co-operation with HR client base).